Hey coffee lovers, do you crave seasonal flavors when it turns cooler? Well, Brooklyn Beans Roastery has a treat for you! 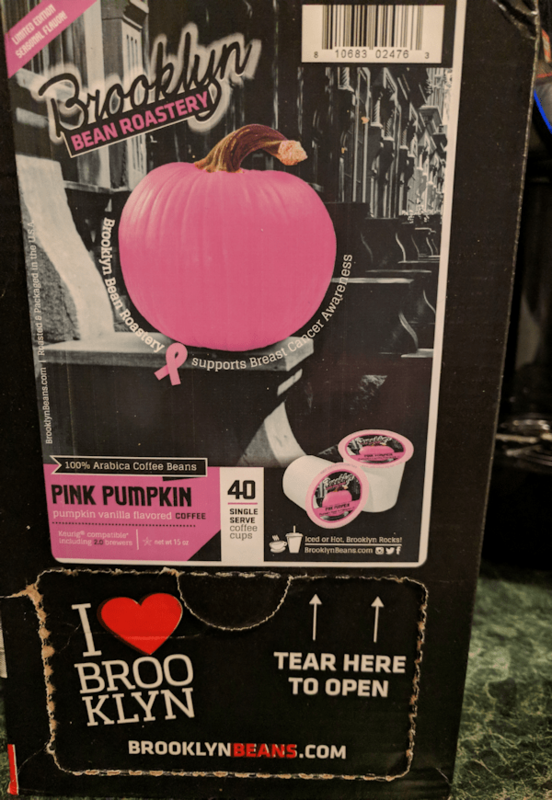 It’s their Pink Pumpkin Coffee. This flavored coffee has the sweet and spicy flavors of pumpkin pie with an extra dollop of vanilla. I like the mellow smoothness of this roast. The single serve cups work well and are compatible with Keurig brewers including the 2.0 model. A portion of the proceeds from the sale of this seasonal coffee goes to breast cancer awareness. Check out our review. Time for the giveaway! The nice folks at Brooklyn Bean has offered 1 Modern Day Gramma (MDG) follower a chance to win a 40 ct box of Pink Pumpkin Coffee. Check out the TOS and rules of the giveaway before entering and good luck! I love dark roast coffee so I would like to try their Cyclone variety. I would love to try the Fuhgeddaboutit Decaf. I would love to try the french roast flavor! I have been able to try out a few of their cups through the last couple years and one stands out the most: Coney Island Caramel. Absolutely delicious! Any of the season sounds devine!! I would also like to try the cocamocha flavor! I’d love to try the hot cider. Anything bold , but I love trying new flavors. I would want to try the black and white cookie kind! Mmmmmm…I would love to try Cocomocha! I would like to try the Milk Chocolate Hot Cocoa first. The Corner Donut Shop medium roast coffee blend sounds fantastic! I’d love to try it. I would love to try the Gingerbread Man! I’d like to try their Cinnamon Subway and their Oh Fudge coffees. I want to try the Cocomocha. I would love to try the Gingerbread Man coffee flavor for winter. I’d like to try the Breakfast Variety pack! I would love to try the Black & White cookie flavor it sounds delicious! I Would love to try gingerbread man. I would love to try their Maple Sleigh! Complex and diverse, just like Brooklyn itself, our Brooklyn Bridge Blend has something for everyone. A medium roast that combines four varieties of coffee, this blend brings together juicy, berry flavors with lighter citru s notes, all combined with a rich, smooth base to produce a cup that will delight your palette and remind you what you love about coffee. They offer Light Roast, Flavored, Dark Roast, 2 different Seasonal, French Roast, Medium Roast, 2 different Varity Packs. I’m pretty much a French Roast person myself. I know I would enjoy trying the Coney Island Carmel flavor.